work, "Leviathan," published in 1651, expressed his idea that basic human motives are selfish. Born prematurely on April 5, 1588, when his mother heard of the coming invasion of the Spanish Armada (a fleet of Spanish warships), Thomas Hobbes later reported that "my mother gave birth to twins: myself and fear." His father, also named Thomas Hobbes, was the vicar (a clergyman in charge of a church) of Westport near Malmesbury in Gloucestershire, England. 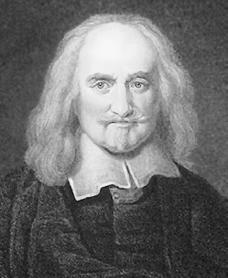 After being involved in a fight with another clergyman outside his own church, the elder Thomas Hobbes was forced to flee to London, England, leaving his wife, two boys and a girl behind. Thomas was then raised and educated by an uncle and studied at the local schools. By the age of six he was studying Latin and Greek. Also at this time, Hobbes became absorbed in the classic literature of ancient Greece. From 1603 to 1608 he studied at Magdalen College, Oxford, where he was bored by the philosophy of Aristotelianism (studying the works of Aristotle, a fourth-century B.C.E. Greek philosopher). The twenty-year-old future philosopher became a tutor to the Cavendish family, a well-known English family. This association provided him with a private library, foreign travel, and introductions to influential people. Hobbes learned to speak Italian and German and soon decided to devote his life to scholarly pursuits. Hobbes, however, was slow in developing his thought—his first work, a translation of Greek historian Thucydides's (died c. 401 B.C.E. ) History of the Peloponnesian Wars, did not appear until 1629. Thucydides held that knowledge of the past was useful for determining correct action, and Hobbes said that he offered the translation during a period of civil unrest as a reminder that the ancients believed democracy (rule by the people) to be the least effective form of government. In Hobbes's own estimation the most important intellectual event of his life occurred when he was forty. While waiting for a friend he wandered into a library and came across a copy of Euclid's (third century B.C.E. ) geometry. His interest in mathematics is reflected in his second work, A Short Treatise on First Principles, which presents a mechanical interpretation of sensation, as well as in his brief stint as mathematics tutor to Charles II (1630–1685). For the rest of his long life Hobbes travelled and published many works. In France he met mathematicians René Descartes (1596–1650) and the Pierre Gassendi (1592–1655). In 1640 he wrote one of the sets of arguments to Descartes's Meditations. Although born into the Elizabethan Age (c. 1550–1600; a time of great change in England), Hobbes outlived all of the major seventeenth-century thinkers. He became a sort of English icon and continued writing, offering new translations of Homer (an eighth-century B.C.E. Greek poet) in his eighties because he had "nothing else to do." When he was past ninety, he became involved in controversies with the Royal Society, an organization of scientists. He invited friends to suggest appropriate epitaphs (an inscription on a tombstone) and favored one that read "this is the true philosopher's stone." He died on December 4, 1679, at the age of ninety-one. The questions Hobbes posed to the world in the seventeenth century are still relevant today, and Hobbes still maintains a strong influence in the world of philosophy. He challenged the relationship between science and religion, and the natural limitations of political power. The diverse intellectual paths of the seventeenth century, which are generically called modern classical philosophy, began by rejecting authorities of the past—especially Aristotle and his peers. Descartes, who founded the rationalist tradition, and Sir Francis Bacon (1561–1626), who is considered the originator of modern empiricism (political theory regarding the British Empire), both sought new methods for achieving scientific knowledge and a clear conception of reality. Hobbes was fascinated by the problem of sense perception, and he extended Galileo's (1564–1642) mechanical physics into an explanation of human cognition (process of learning). He believed the origin of all thought is sensation, which consists of mental images produced by the pressure of motion of external objects. Thus Hobbes anticipated later thought by explaining differences between the external object and the internal image. These sense images are extended by the power of memory and imagination. Understanding and reason, which distinguish men from other animals, are a product of our ability to use speech. Hobbes explains the connection between nature, man, and society through the law of inertia ("bodies at rest tend to stay at rest; bodies in motion tend to stay in motion"). Thus man's desire to do what he wants is checked only by an equal and opposite need for security. Society "is but an artificial man" invented by man, so to understand politics one should merely consider himself as part of nature. Such a reading is cold comfort as life before society is characterized by Hobbes, in a famous quotation, as "solitary, poor, nasty, brutish and short." The equality of human desire is matched by an economy of natural satisfactions. Men are addicted to power because gaining power is the only guarantee of living well. Such men live in a state of constant war, driven by competition and desire for the same goods. The important result of this view is man's natural right to seek self-preservation (protection of one's self) by any means. In this state of nature there is no value above self-interest because the absence of common power results in the absence of law and justice. But there is a second law of nature that men may surrender their individual will to the state. This "social contract" binds the individual to treat others as he expects to be treated by them. In Hobbes's view the sovereign power of a commonwealth (England's power over its colonies) is absolute and not subject to the laws of its citizens. Obedience will remain as long as the sovereign (England) fulfills the social contract by protecting the rights of the individual. According to these laws Hobbes believed that rebellion is, by definition, unjust. However, should a revolution prove victorious, a new absolute sovereignty would rise up to take the place of the old one. Condren, Conal. Thomas Hobbes. New York: Twayne Publishers, 2000. Green, Arnold W. Hobbes and Human Nature. New Brunswick, NJ: Transaction Publishers, 1993. Martinich, Aloysius. Hobbes: A Biography. New York: Cambridge University Press, 1999.